Three years after Adobe launched Content-Aware Fill to “magically” fill gaps in photos, the tool is coming to video. On Wednesday, April 3, Adobe announced a list of new features and performance improvements for the brand’s video and audio applications, including Content-Aware Fill for After Effects, workflow enhancements for Premiere Pro, and new punch and roll and ambient audio ducking for Audition. Adobe made the announcements ahead of the NAB (National Association of Broadcasters) Show 2019, which runs April 6-11 in Las Vegas. The list of updates focuses on performance, stability, and innovation, Adobe says. Adobe Photoshop’s Content-Aware Fill, overhauled with artificial intelligence last year, can quickly fill gaps left as a result of removing objects from an image by analyzing the surround pixels. After Effects now boasts a similar tool, but it rather than filling in a gap on a single image, it can do it seamlessly across multiple frames of video. The feature is among the biggest user requests, but Adobe says the challenge was to not only remove the object and fill the gaps, but to get a consistent look in all the frames, even if the camera is moving. Previously, video editors would have to export a sequence into Photoshop and manually apply Content-Aware Fill on a frame-by-frame basis, but the frames wouldn’t perfectly match up when recombined into video. 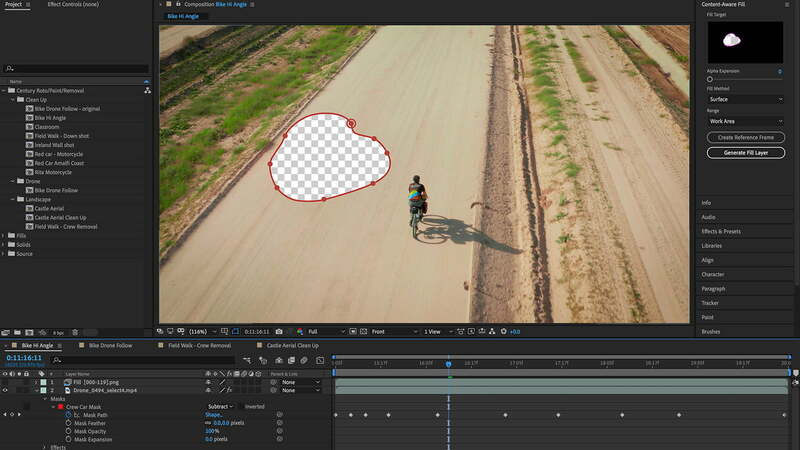 Adobe says the Content-Aware Fill inside After Effects analyzes motion in the footage to determine how to fill those gaps with the video’s movement in mind, leading to smoother results. Adobe says the tool can be used to remove things like a boom mic that dropped into frame, or perform more involved edits like removing people. Content-Aware Fill will come to After Effects with the next update. 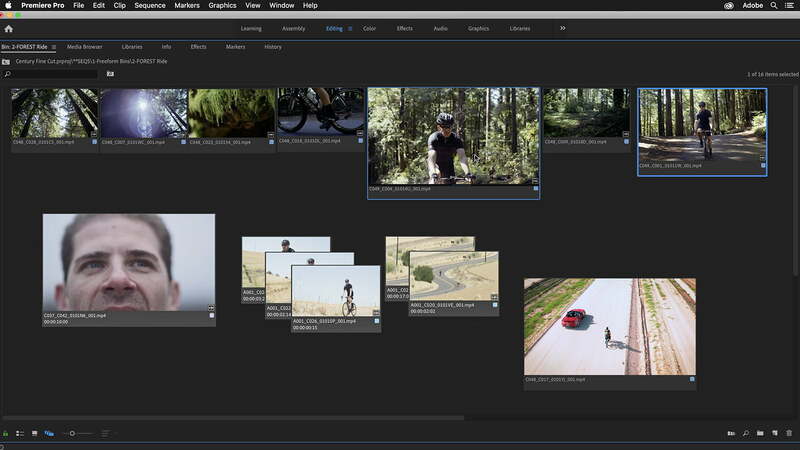 Premiere Pro is receiving some welcome workflow and interface improvements. The new freeform view option gives editors what Adobe calls an “in-app canvas” for organizing footage. Inside this view, users can drag and drop clips to organize into groups, such as separating A-roll and B-roll footage. Presets will allow organization schemes to be easily repeated for different projects. The Essential Graphics panel also sees a handful of updates. When working with graphics, users can add multiple strokes to the same object or text (a style Adobe says is popular in Japan). Adding a background to the lower third, cutting holes in graphics using a mask, and the option to group graphics are also part of the update. 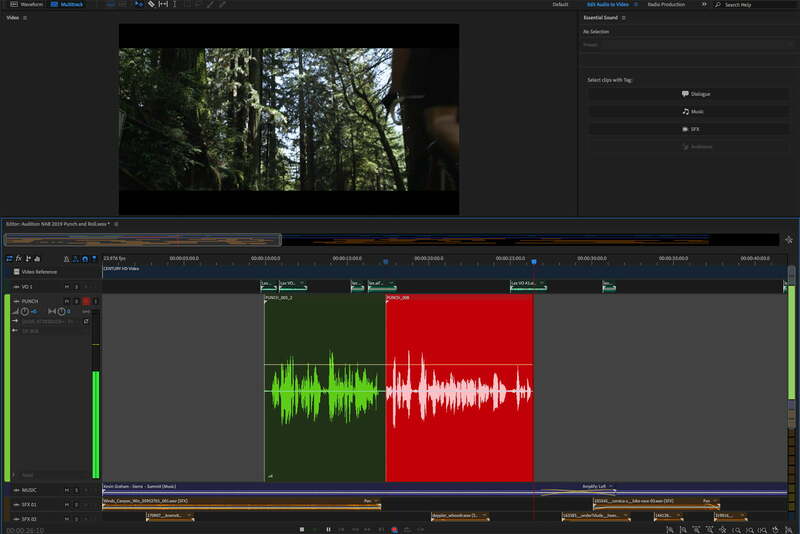 Audition, Adobe’s audio editing program, gains a new punch and roll workflow for re-recording segments of voice-overs. With the feature, users can navigate where they’d like to correct a mistake in the audio. The software will then play a few seconds of the existing recording and count down to that spot, allowing users to more easily match the original recording. The tool allows users to capture multiple takes. Ambient ducking will automatically adjust the volume of the ambient noise when mixing audio sources, similar to how auto ducking for music works in the current version of Audition. Adobe today also announced updates to Character Animator, a program that automatically animates video feeds, including new triggers that work with Twitch livestreaming. The feature allows streamers to let viewers trigger an action, like a dance move or costume change. The Creative Cloud updates begin rolling out today.